Wanna get unbeatable odds on Atletico Madrid v Chelsea? Find here how to claim your price boost at 888sport! Promotion is valid until September 27th 2017 19:44:59 GMT. Any bets placed after the start of the Atlético Madrid vs Chelsea match will be paid out at normal odds. 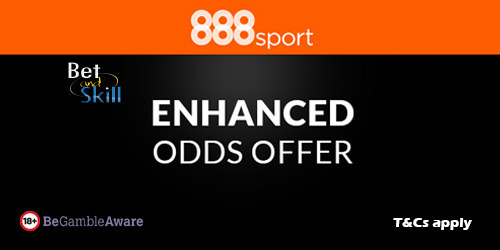 In order to be eligible for this promotion, members must first make a deposit of at least £10 using the promotional code “888odds”. Only members who make a successful deposit using the promotion code will receive enhanced odds. A qualifying bet is a ‘real money’ stake of at least £5 placed on either Atlético Madrid or Chelsea to win. (‘Match’ winner market only). The maximum stake for the Enhanced Odds is £/$/€10, any stake above this amount will be paid out at the normal odds. Only the first bet placed following registration on either Atlético Madrid or Chelsea will qualify for this promotion. This promotion replaces the welcome offer. The first bet placed following registration on any other market will receive the original welcome offer of “Bet £10” Get £30. Free bet tokens will be applied to qualifying accounts on the 28th of September 2017 (please allow 72 hours in extenuating circumstances). "Get 5/1 Atletico Madrid or 10/1 Chelsea to win at 888Sport (Champions League odds - 27.9.2017)"